This post is one I’ve been thinking about sharing for a while now, but I kept putting it off as I felt like there’s already so many blogging advice related posts out there. I personally love reading blog advice or photography tip posts as I find them so helpful towards running my own blog, that’s why I finally decided to share mine. Blogging is unique, yes we all take photos and share some text related to the picture, but everyone has their own style of blogging, that’s what makes blogging so unique. Above is a picture of my little desk/office/beauty area. It’s my little area where I sit and blog, play around with makeup, plan future blog posts, take blog and Instagram photos etc. 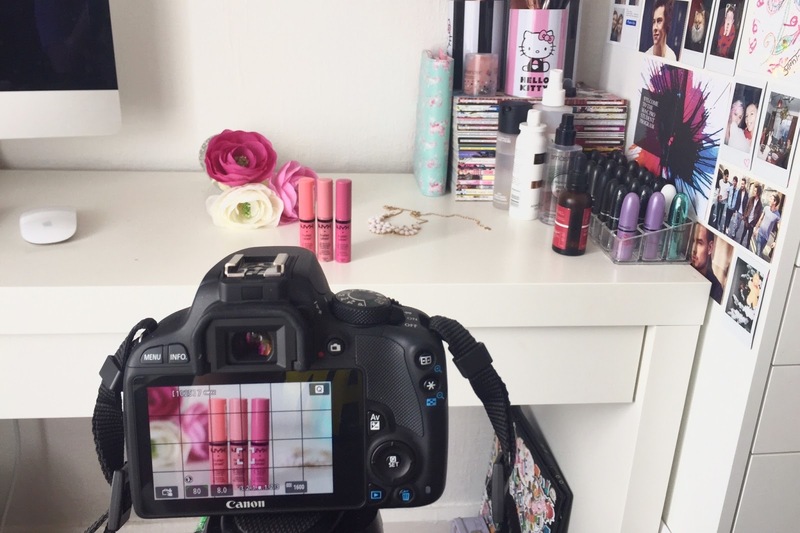 It’s taken me many years to get it to how I like it, back when I started blogging I stored all my makeup in a makeup bag and blogged from my bed. As my love for makeup and blogging has increased, I invested money into creating my own little beauty area. 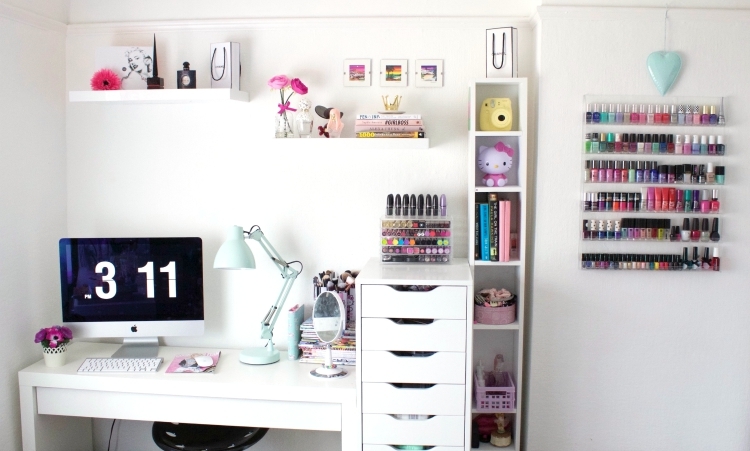 My desk is the IKEA Malm Dressing Table, next to that is my IKEA Alex 9 Drawers which I store most of my makeup and beauty products in. I also store my lip products in a set of Muji drawers, I really should get around to sharing an updated makeup collection and storage post soon! I then have a tall shelving unit which I’m sure was from Argos but I can’t find it on the website as I’ve had it for years. I have two floating shelves on my wall which I store some of my books, perfumes, and random little bits on. My nail polishes are stored on this wall rack I got from Amazon, whenever I share pictures of this on Twitter/Instagram everybody seems to love it and ask me questions about it. Now onto the technical stuff, I want to start off by saying that what I have and use to blog is obviously not compulsory. I started my blog using photos I’d taken on my iPhone 4, it’s just over the years as my interest in photography has increased I’ve decided to invest in more ‘professional’ equipment. My photos really aren’t the best, I’m not going to lie, my camera still confuses the hell out of me and I’m only just getting used to the manual settings! I have two cameras, the Panasonic Lumix G3 and the Canon 100D with the 50mm 1.8 STM lens. I used the Lumix for most my blog photos in 2014, and then at the end of the year I upgraded to the Canon 100D. I originally wanted the Canon 700D, but it was way out of my budget so I settled for the 100D. Whilst it’s a nice camera, the fact it doesn’t have a flip out screen bugs me and I’m currently saving for a 700D as the price has practically halved since I first wanted to get it. I use the Panasonic Lumix mainly for my makeup pictures (aka selfies) and my eye closeups that I post over on Instagram as it has a flip out screen so I can see what I’m doing. I do also own lighting but I hardly use it, in fact I don’t even think I’ve got them out this year. I use these soft boxes but I’m not keen on the artificial look lighting gives, so when the natural lighting is good I’ll set up and take a good week or two worth of pictures for me to edit and schedule. As for my tripod, I use this one I picked up from Argos. When it comes to computers, I have both an iMac and a MacBook Air. Obviously you don’t need both, or either. I used my old windows laptop for years whilst I saved for an iMac, and the MacBook is only a recent addition to my life. As much as I love my iMac, sitting at my desk for hours wasn’t great so I made the jump and bought a 13″ MacBook Air. Now I’m not stuck to my desk, I can get stuff done on the go and be super lazy and have a little editing session on the sofa.. professional! I also get on with Apple more than I do windows so for me it’s worth the investment, and it’s so easy to transfer things from either my iMac or MacBook to my iPhone and iPad. When it comes to taking my blog photos, I pretty much stick to the same setup. I simply clear off a section of my desk, pop some fake flowers behind the products and take the pictures using my camera on it’s tripod. 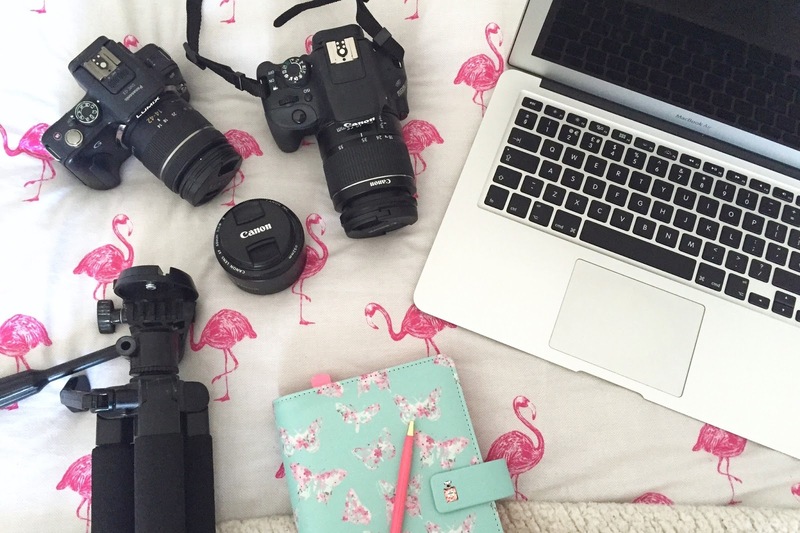 If I’m creating a flat lay, I’ll do the same but lay the products out on my desk and take the picture from above. As for the settings I’ll use on my camera, that can change from day to day depending on the time of the day and what the natural lighting is like. As for editing my pictures, I usually adjust the settings on the camera to save me having to edit them much. I’m only just stepping into using the manual setting, something that has took many hours of watching YouTube videos to even attempt! Tech is really not my strong side but I felt like having such an expensive camera I wanted to learn how to actually use it! When I do need to edit my pictures, I’ll just do it on iPhoto or sometimes I’ll use Picmonkey, especially when it comes to making collages. I use Blogger to write up and share my blog posts, you can also use WordPress but I’ve never tried that one and I’ve heard it’s more complicated. I find Blogger easy to use and I’ve just always stuck to it over the years. My domain is one that I purchased from GoDaddy as when you set up you’re blog your given a name like scolvinbeauty.blogspot.co.uk, but I didn’t want the .blogspot part in it so I purchased my domain so now it’s scolvinbeauty.co.uk. I think it costs me around £6.99 a year, which for me it’s worth every penny. As for my blog design, it’s changed so many times over the years, and it’s only now that I’m getting it to a point that I’m happy with. My blog design is one I bought from Pipdig, who I strongly recommend for a reasonably priced yet professional looking blog design, they’re also really great at getting back to you if you’re having any problems with the design or installation. My header is also one that I got from Pidig but won’t be around for much longer as the lovely Jemma is designing me a new one, eeeep I’m so excited! So I think I’ve covered all the basic areas I wanted to share in this post, this is only the first in a series of blog related posts I’m going to be sharing over the next few weeks. Hope you found this helpful! If you have any questions, feel free to leave them below!